Installation was actually challenging for the FSP CMT520 Plus. We did not get a manual for this case, and so I was at a loss to know which screws went where. A manual is supposed to be included, but I found the PDF file online. Otherwise, the case itself is easy to build in. There is plenty of space and the cables can be managed easily. The front pops off with some difficulty and it is quite difficult to work on it, because the whole front panel stays on unless you reroute all the front I/O cables. The front I/O cables keep the front panel on, making it difficult to install a radiator. Another difficulty came in the form of some limited space in the power supply area. The hard drive bays at the bottom cannot be removed or even shifted to the side, making it hard if you have a longer power supply. The maximum amount of room for the power supply is 200 mm. This is enough room, but it was hard to fit any extra cables down there. I tried harder this time to fix the cable management. FSP definitely has the tools to clean up the back of the case. There are plenty of cable loops to tie the cables down and organize them properly. FSP also ensured that there is enough room to close the back panel. There is about 25 mm gap, which should easily fit all the cables you are stuffing in there. After pushing down the cables a bit, it was very easy to close the back panel. The cable on the fan hub attached to the button on the front I/O has a very loose connection, meaning I had to be super careful when I was organizing the cables and closing the case to make sure it did not just pop out. The overall look of the case with all the ARGB fans on is amazing. From further away, there is a bit of a depth effect created, because the fans are receded from the front glass panel. FSP has expanded on the many different modes for the LEDs; above are the main ones. 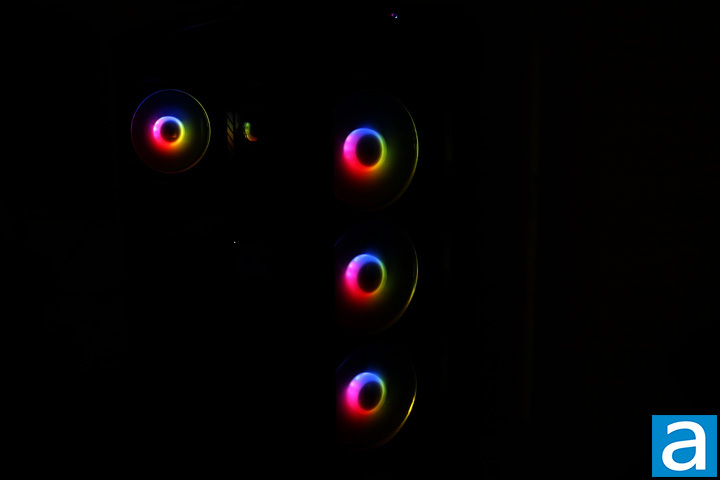 The LEDs will either change color as they spin in a circle, creating some of the cool effects seen above. One can also select a static color from quite a few colors. An issue I ran into was that after my computer was on for a while, I was unable to change the LED colors. I would have to restart and cycle through them again. 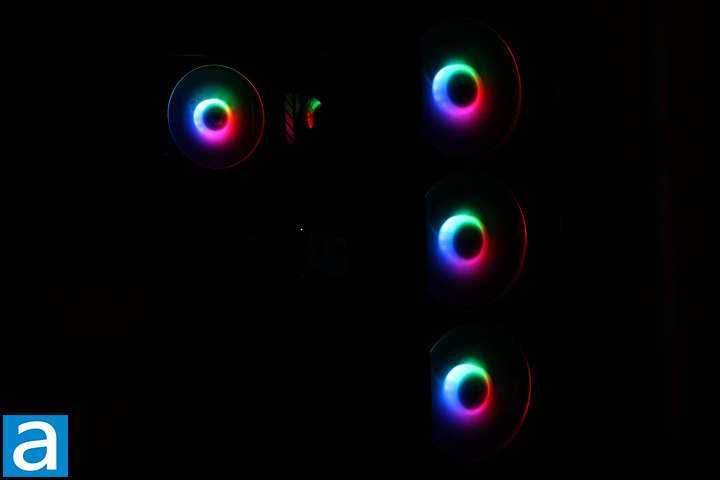 Although FSP has improved on their RGB functionality, there are still some downsides. 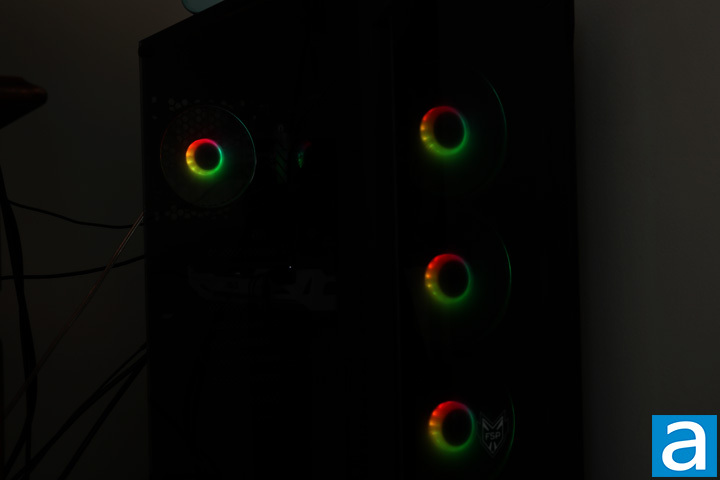 Using a single button to change through so many colors is clunky, however, the fans are meant to connect to a motherboard and they will be easier to control then. On our particular batch, it did not save the RGB configuration, but the company says current revisions you can buy will remember the settings. 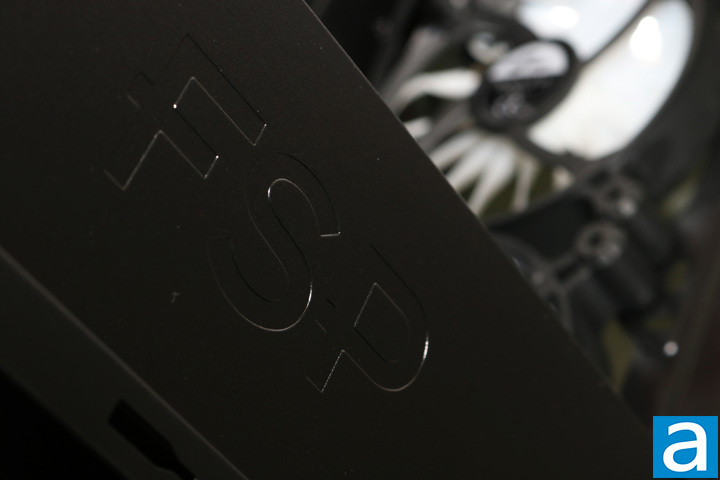 The fans of the FSP CMT520 Plus are reasonably quiet. At idle and on a scale from 1 to 10, where 10 is loud and 1 is silent, the fans come in around 3.0/10 in my opinion. As the RPM increased, the fans became noticeably louder, coming in at 5.0/10. 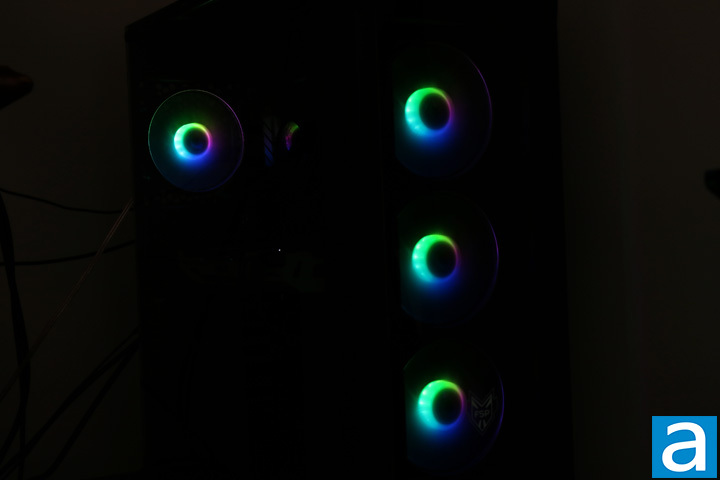 The FSP CMT520 Plus has new ARGB fans, definitely bringing more color to my computer's life. The overall look of the FSP CMT520 Plus is great with the tempered glass front and side panel. The front has a bit of a depth effect, which is pretty cool too. The tempered glass definitely improves the overall feel and quality of the case. Furthermore, the FSP CMT520 Plus is sturdily built, and should be a case that will last forever. The fans themselves are good, performing well and silently to boot. Otherwise, the ARGB implementation is good, illuminating the entirety of the fan and not just some of its parts. Moving up to the I/O, the buttons are sort of squishy, but still have a click with it. The power button LED does not change with the rest of the colors, which could be quite annoying if you are looking for a consistent look. The ARGB cycle button is difficult press, since it is small and sits flush with the case. 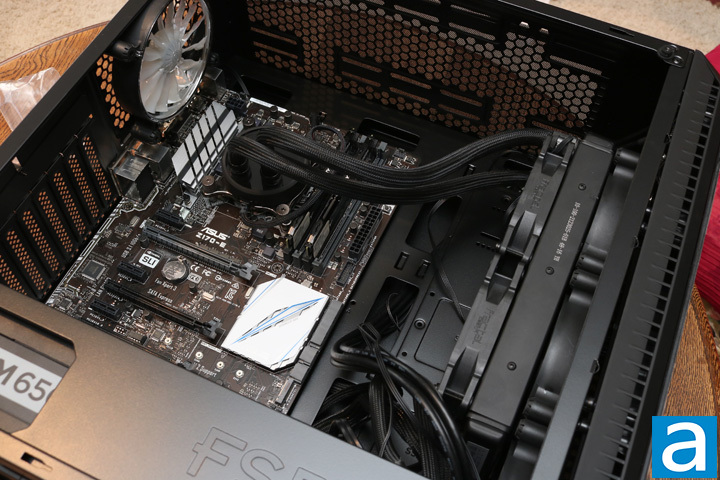 When it comes to assembling your PC, the FSP CMT520 Plus has plenty of room on the inside to easily route cables around even to normally tight spots. The open space also allows for plenty of cooling options. The front panel is hard to remove because of how the cables are routed, but again this is a minor complaint. 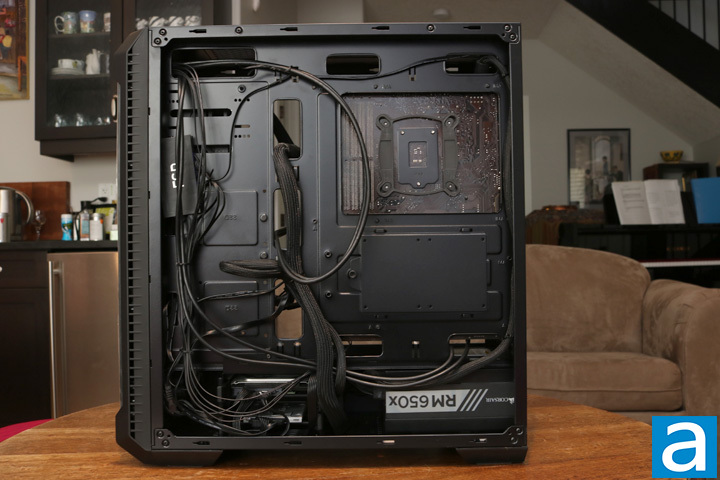 Cable management on the back is easy, and there is plenty of room for storage. The biggest limitation on the back is the smaller space by the power supply and the fact that you cannot move the hard drive bay. The fan hub is a great addition, especially with its extra functionality for the possibility to plug into a motherboard. The loose connector on the fan hub is a bit of a drawback, but it can be worked around. The ARGB functionality, although it has been expanded on, is still clunky if you do not have an ARGB compatible motherboard. Especially after a few clicks of the button, the color cannot be changed until you restart the PC. The FSP CMT520 Plus comes in at $120 USD, which, for an extra $15 over the CMT520, is quite reasonable for the extra color it brings into your life. FSP provided this product to APH Networks for the purpose of evaluation. Do you have any comments or questions about the FSP CMT520 Plus? Drop by our Forums. Registration is free, and it only takes a minute! posted 3 hours and 16 minutes ago, with 1 posts. posted 3 hours and 17 minutes ago, with 8 posts. posted 3 hours and 22 minutes ago, with 11 posts.